Kolaches, the pastry that can be described as cross between a doughnut and a cheesecake, or similar to a danish, have been traditionally difficult to find in the Brookline Boston area. That is, until about a year ago when Daisy Chow, a baker at Brookline’s award winning Clear Flour Bakery near Packard’s Corner and the popular breakfast and sandwich shop Cutty’s in Brookline Village, changed that. The puffy pastry can be sweet or savory, and does not necessarily have to involve sweet cheese. It is a West, Texas staple for many, popularized by a stop between Dallas and Austin. Chow, who has been working for a baker’s dozen of years at Clear Flour Bakery, started to roll around the idea of starting her own bakery. A couple years ago she gathered up a business plan and was about to purchase a bakery space in JP, until the owners of that bakery doubled their asking price at the last minute. It was too much for Chow. The experience made her cautious, but it also galvanized her desire to set up shop somewhere in the Boston area. If she were to do that, she knew she needed to be extra smart. Her bosses at Cutty’s, which helped incubate Bagelsaurus before it rolled out on as its own bagel shop in Cambridge suggested she use their kitchen for a weekly pop up at their shop and she could still work at Clear Flour. Daisy would work for Cutty’s as an employee, use their ingredients and their customer base and make products to test them out on buying customers. “It’s a very low risk testing ground for me to test out products, to try new flavors or different styles of baked goods,” she said. She tries it out on the Cutty’s staff first then, if it’s good, she sends it out to the world. On Aug. 1, 2016, she put raspberry and cream cheese kolaches in the front case for the world to try. And by the end of the morning those had sold out. “It was a hit because no one else was making kolaches. It was a fresh new item,” said Chow for whom modesty comes naturally. But the fact that they were delicious helped. 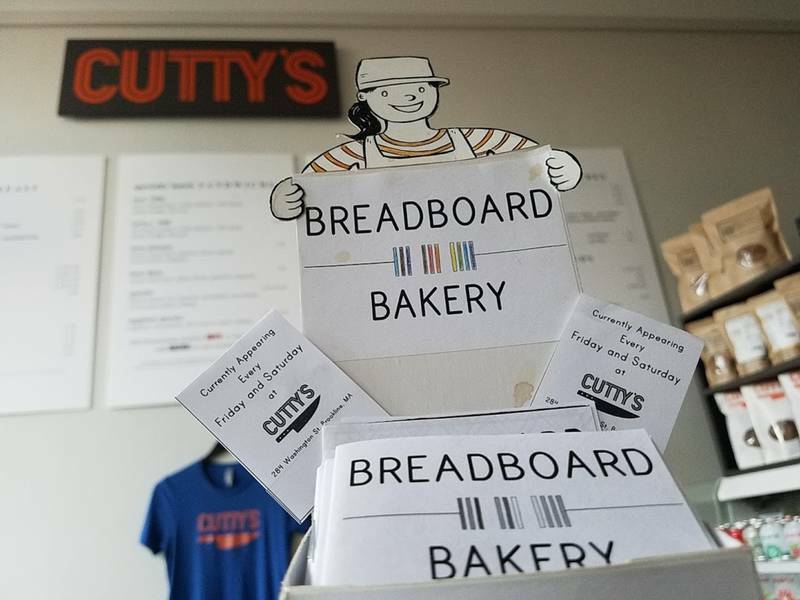 The owners of Cutty’s are enthusiastic about Breadboard Bakery and are convinced once she secures a spot, it will draw a crowd. “We love working with Daisy. She’s so, so, so hardworking, talented, and most of all, fun. She has so many cool, tasty ideas for her future bakery and that’s why we’re helping her,” said Charles Kelsey, who owns Cutty’s with his wife Rachel. “We recognize her potential to create delicious greatness,” he said, adding they hope the pop-up helps send her off on her own. Chow makes baked goods she enjoys eating. And she’d had a hankering for the treat she knew from Texas, but no one else was making them around Brookline. So, the baker did what any baker would do. She made them herself. And then, like any baker might do, she brought some in to Cutty’s for the folks at work to share. “Charles was like you gotta make those here,” she remembers. So she did. In the past year she has also made “wacky cake,” croissants, cinnamon knots, her take on the Swedish cinnamon roll, she has also tried biscuits. But the kolaches are probably the most popular, she said. It is complex and made with some of the best cocoa you can buy, she said, but the recipe is a take on a simple easy cake recipe (with no butter, thus the wacky) that reminded her of her elementary school lunch days. Every Friday pizza and chocolate “wacky cake” was on the menu. Most fun and satisfying to make are the croissants. It’s a lot of hard work and labor and she has to stand on a wooden box to get leverage. “But when they turn out really well, then I’m really happy,” she said. Because Cutty’s is not set up like a bakery, Chow says the restrictions in place, like standing on a wooden box to get leverage to make her croissants just right, is also helpful as she works toward getting a bakery of her own. “Real” bakery equipment is expensive and working out ways to make delicious, quality baked goods without the expensive equipment means when she does find a bakery home of her own she can start up with less money. Chow is old school, artisan and plans to stay that way. She makes everything by hand, rather than by machines, and everything is fresh. She makes everything morning of, or night before. She is also a perfectionist. When she walks into the kitchen to make her bread or baked goods, she is in a competition with herself. She says baking is all about paying attention and just being careful. That part is easy for her. She also takes pride in offering consistently good baked goods. “I like consistency and rules, and repetition and it sort of explains why I really like making baguettes. Who is Daisy Chow, anyway? Chow, originally from a suburb near Dallas, Texas grew up around food. Her parents owned a restaurant and both were whizzes in the kitchen and she inherited that love for experimenting in the kitchen. When she went to Columbia University all she knew was that she loved math, so upon her brother’s suggestion, she majored in Electrical Engineering. But in between classes, she made her way around the city by reading Zagat food reviews and trying out the restaurants that were within her budget, writing reviews for the school newspaper as she went. So it might not come as much of a surprise that it didn’t take too long out of school and working at a Cambridge start up in her field, before Chow realized it was really food that she was passionate about. “I loved eating. I loved food, so I looked through the classified for restaurant jobs,” she said. She tried her hand at a number of different restaurants working as a cook for places with odd hours until she landed at Clear Flour on a tip from a co-worker. And now, more than a decade after she first started working there and a year after she began selling her kolaches at Cutty’s, she had her first Breadboard bakery popup at Clear Flour. Her baked goods sold out within two hours and a week later people are still coming in asking for more. What’s in a name? Breadboard Bakery? The name ties her Electrical engineering together with her love for bread a staple around the world.